I would like to make this talk more interesting by making it more clinical, making it evidence based, and a few learning points which I would like each of us to have from this talk from a nephrologist perspective. 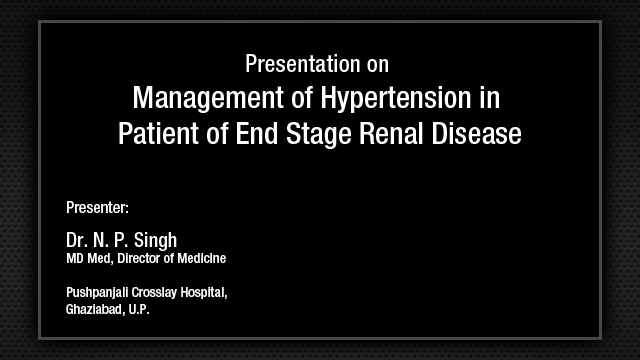 My talk assigned is hypertension in stage I and stage II chronic kidney disease and the role of diuretics. It was long time back when Sir Richard Bright who was the first one who identified a very, very strong bond between small kidneys, hypertension, and edema. After even Richard Bright in 1830s, now we have understood that it is the volume excess in patients with kidney disease which leads to hypertension and if we increase the frequency and spacing of hemodialysis we have seen that hypertension can be completely abolished in patients who are treated with daily hemodialysis sessions. My job is like Einstein to make this talk very simple, very lucid so that each of us will go with a clear cut message. 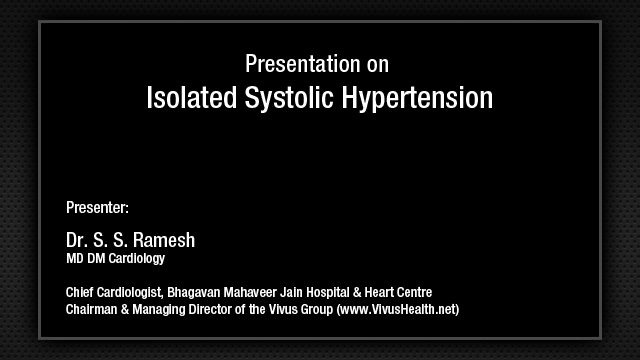 We will take you to various aspects of hypertension from controlling hypertension to renoprotective effects of mineralocorticoids in patients with protein uric renal disease which is the latest publication in the C. Jason and as Dr. Sethi said it is the sympathetic nervous system which leads to hypertension, one of the very important factors and the recent is resistant hypertension can be abolished by targeting the baroreceptors, which is the new thing which has come up in the management. I would like to take you through some cases making it more clinical. 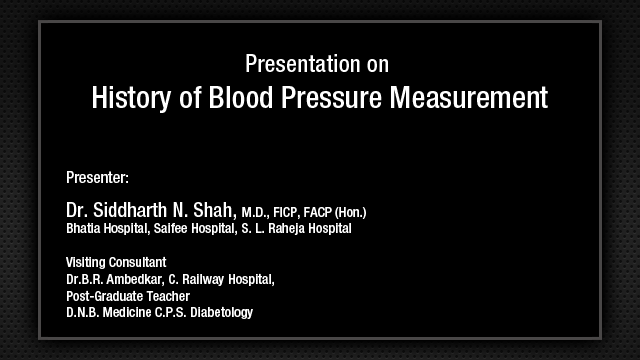 Some pathophysiological aspects of hypertension as Dr. Sethi had guided us, current evidences and treatment, what are the role of diuretics, and some learning points. CASE 1: He is a radiologist. A 45-year-old male weighing 90 kg, he actually came up to our OPD. He is a nonsmoker, nondiabetic, regular exercises. He has hypertension since last one year. He was diagnosed chronic kidney disease because he had proteinuria of 1 gm/dL. He had been on multiple medications, basically was referred from the physician for uncontrolled hypertension because his blood pressure used to remain 200/100 mmHg in spite being on telmisartan 80 mg/day twice a day, ramipril 5 mg twice a day, metoprolol 50 mg twice a day, and moxonidine 0.3 mg twice a day. He did not respond. His blood pressure still remained high, what should be done? He is referred by a physician and he himself is a radiologist and it actually was not a challenge, it was a very simple case. We would discuss this at a later stage. CASE II: She was a 9-year-old girl weighing 23 kg, chronic kidney disease stage V, renal dysgenesis. She was on chronic ambulatory peritoneal dialysis. She was a high transporter. She was having a resistant hypertension and she was on following drugs. She was on nifedipine retard 30 mg four times a day, carvedilol 12.5 mg twice a day, clonidine full doses, prazosin, minoxidil, she was on telmisartan, ramipril, and torsemide. She was referred to us for kidney transplant and her blood pressure even in spite of these eight drugs remained 180/110. We planned a transplant urgently, I will tell you why. Complications of chronic kidney disease: Basically, hypertension begins very early in chronic kidney disease as early as stage I. Almost 20% to 25% of patient’s with hypertension would be in stage I chronic kidney disease. This would progressively increase and almost 100% of patients with stage V would be having hypertension requiring multiple drugs to control it. The stage I and stage II chronic kidney disease, actually there is slight decrease in GFR, but this recent article which has been published just a week back, the stage I and stage II is not called as a CKD, CKD comes when the GFR falls less than 60, it is termed as NKD now. Andrew Levey very well from the Tufts Medical University where my boss was working with him they have redefined chronic kidney disease stage I and stage II because many elderly patients if you calculate the creatinine clearance of a patient who is 60 years old, weighing 40 kg, the creatinine clearance would be very less though they may not have a kidney disease. Therefore, stage I and stage II now applies to people who are elderly with low GFR and with or without kidney disease and they are being termed as NKD. So it is not CKD, it is NKD and we will talk more of chronic kidney disease and NKD as vis-à-vis CKD. As Sir has elegantly talked about the various pathophysiological aspects of hypertension in chronic kidney disease, the key aspect is, first is the activation of renin-angiotensin system which is the R that means renin is released. Second is the ECF volume expansion which is mediated by the kidneys. Third is the activation of sympathetic nervous system which elegantly Sir has described very well. Fourth is the endothelial dysfunction which also comes from the kidneys by production of asymmetric dimethylarginine and the fifth is aortic stiffness. So essentially, everything comes from the kidneys. It is the renin-angiotensin, the volume balance comes from the kidneys, sympathetic nerves as Dr. Sethi has elegantly described about the connection of the brain and the kidney, asymmetric dimethylarginine which is a waste product of protein metabolism that comes from the kidney, and aortic stiffness which is a part of secondary hyperparathyroidism because it is the secondary hyperparathyroidism which causes calcium deposition in the blood vessels and this calcium deposition makes your arteries stiffer. This is the CT scan which we took last week. This was basically done for some other thing. This was the aorta of a patient who was 60 years old, normal creatinine, blood pressure remaining 100/110, he is a diabetic and you would see that the whole aorta is calcified. The hypertension and chronic kidney disease, it is not only renin-angiotensin, ECF volume, sympathetic nervous, dimethylarginine, it is also the aortic stiffness where the role of diuretic comes into play. Why we are talking about this volume expansion? There has been a very recent review article in the New England Journal of Medicine which has reviewed the effects of salt in health and disease. It’s a delicate balance. What happens when you chronically have a high intake of salt? Not only it causes the increase in the arterial pressure, on the blood vessels it cause oxidative stress, endothelial dysfunction, fibrosis and decrease vascular elasticity. On the heart, hypertrophy, diastolic dysfunction, systemic dysfunction. Glomerular injury and renal failure in the kidneys. That’s what we know of sodium chloride, so sodium is bad, but why sodium chloride? On my breakfast I was just counting my sodium and how much sodium I have consumed. You will not believe it how much sodium one must consumed in the breakfast? Around 12 g of sodium must have gone minimum. What happens in this typical modern western diet and the kidneys in the pathogenesis of the hypertension. The modern diet contains a high sodium and a low potassium which eventually leads to retention of sodium by the kidneys and the deficiency of potassium leads to a deficiency of cellular potassium which causes the activation of sodium potassium ATPases which has the effects on the extracellular volume expansion. It also causes the excess of cellular sodium which ultimately leads to vascular smooth muscle cell contraction, increased peripheral vascular resistance, and hypertension. It is this high sodium in our diet which we consume is a predominant cause for hypertension especially when it is related to volume. Now, we come to one of the most basic things which came up somewhere in 1984 and that was the Laragh’s volume vasoconstriction spectrum of clinical hypertension. What did Laragh say was he classified hypertension into two clinical types, first the patients who had high plasma renin activity and the second, patients who had high total body sodium, that means patients who were excess in volume. He defined the PRA into three types. The high PRA, the medium PRA, and low PRA. He found that those patients with high PRA, that means a high plasma renin activity, would produce more angiotensin II and they will produce more vasoconstriction and whereby which would lead to hypertension. Whereas patients with low total body sodium, medium and high total body sodium and this would cause a significant increase in volume if you had a high total body sodium. Eventually, the entire spectrum of hypertension falls into this two clinical types, that is, patient’s with high PRA or patients with high total body sodium. When Laragh classified hypertension, if there was a high total body renin activity or high plasm renin activity, the plasma renin activity was high in patients with malignant hypertension, patients with renovascular, high renin essential, and patients with pheochromocytoma. Essentially, patients with high PRA had in this four clinical types. Medium PRA was seen in patients with medium renin essential hypertension and bilateral renal vascular hypertension. Low renin hypertension was seen in typical with low renin essential hypertension and a high primary hyperaldosteronism. Primary hyperaldosteronism is a volume mediated disease and this is what Laragh said. If you see the entire studies which were done till date they have never addressed individualization of patients with hypertension whether they are high renin or high in volume. Every one of us or all the speakers in the morning have said because there is no evidence till date, because nobody has individualized therapy for hypertension based on the plasma renin activity or based on the total body sodium. How will you classify antihypertensives? Antihypertensives are classified whether they are renin drugs or they are volume drugs. They are basically classified in two. This is just to make you understand why it is important because it is this basic mechanism which decides whether the blood pressure is going to remain controlled or it is going to remain uncontrolled. Renin drugs, ACE inhibitors, ARBs, direct renin inhibitors, beta-blockers. Centrally acting drugs like moxonidine, clonidine, reserpine. The diuretics, the calcium channel blockers, alpha-blockers, they contribute to the volume drugs. Basically, all anti-hypertensive drugs are classified into the renin drugs and the volume drugs. The goal for hypertension as we all know in patients with renal disease it is less than 130/80 multiple evidences are there, but what about the number of antihypertensive medications? Most of the studies till date which include UKPDS, MDRD, HOT, AASK, RENAAL, and IDNT, the average number of antihypertensives required in all the studies were 2.7 drugs, averagely 3 drugs to control the hypertension, but none of these studies addressed whether which drug was to use when. Then there was a paradigm shift and this paradigm shift came after the ONTARGET trial which said that telmisartan and ramipril were actually not doing any good to the patients and they should not be considered as renoprotective agents anymore because they were doing more harm than good to patients who were at high risk of vascular disease, high risk of cardiovascular events, and high risk diabetic patients who were more prone to chronic kidney disease and what were the results. A very interesting outcome of the study. These patients who were on two renin mediated drugs, when you suppress renin too much what happens, you develop renal impairment and that is what the study said. It was a recommendation that telmisartan was equivalent to ramipril with patients with high risk vascular disease. Only advantage was less angioedema, but the combination of drugs did not do any good. It actually had a very high incidence of renal impairment as compared to these drugs used alone. The second important aspect which came about was the LORFFAB. This was published in a journal which was hardly heard about, that is, the International Urology and Nephrology Journal because there were takers to this concept. LORFFAB is late onset renal failure because of angiotensin receptor blockade. This study was published by professor Oreopoulos from Canada and what did he find was, he found that the RAAS blockade with ACE and ARBs despite increasing the utilization in the US they have discontinued because this was causing worsening of renal failure. The conclusions of this study, I would like to read this out, worsening azotemia and older susceptible CKD patients on ARBs often but not always associated with known precipitating risk factors remain unrecognized. Sustained improvement in eGFR often follows the discontinuation of these ARBs. The practicing physician should be well aware of these syndromes. What happens when you use ARBs for a very very long time, if they remained unmonitored, that is, it significantly reduces the renal perfusion and if the renal perfusion is reduced for a very long time the ACE and ARBs interfere with the mechanism which are the adaptive mechanism specially in the late chronic kidney disease and these patient’s have a higher risk of progression to chronic kidney disease. There was one patient one of the audience had asked, why this patient progressed. This patient progressed because over a period of time when the renal perfusion is low then it becomes a state like a renal artery stenosis because of significant resistance, because of the interstitial fibrosis which occurs in the afferent arterioles and the smaller arterioles, the segmental arterioles. There are significant interstitial fibrosis and there are no adaptive mechanism, therefore these patients they progress and if you stop the ARBs completely, majority of the patient’s would recover their renal function, but it has to be very very prompt. This is a syndrome which one should recognize and therefore monitoring of serum creatinine is extremely important in patients with chronic kidney disease after the creatinine of 2. If you have a significant increase in the creatinine, if the creatinine jumps by more than 30% it has to be immediately withdrawn, that means there is a significant hemodynamic compromise intrarenally which is very difficult to explain, but if you stop these ARBs completely you can actually have an improvement in renal function. Now, we come to the role of diuretics. I would like to highlight something about the sodium balance and how sodium handling is done by the kidney. Sodium is a molecule which has a very low molecular weight. It is completely filtered by the kidney. The majority of the sodium, 65% to 70% of the sodium is absorbed from the proximal convoluted tubule, the loop handles around 25% of the sodium, the distal tubule handles around 5% of the sodium, and the collecting duct handles only 1% to 2% of the sodium. The sodium majority is handled in the proximal convoluted tubule. In patients with chronic kidney disease or in any hypertension the proximal convoluted tubule diuretics, mainly the carbonic anhydrase inhibitors, they cannot be used as an antihypertensive agents because of their potential side effects. Proximal convoluted diuretics cannot be used for hypertension. Loop diuretics are very very potent diuretics. They have to be used whenever the kidney function is less than 30 mL per minute, when the GFR is less than 30 then loop diuretics is beneficial. Why loop is not used, because once you give a loop diuretic there is a significant proximal tubular reabsorption of sodium and water and this significant proximal tubular reabsorption of sodium and water ameliorates the antihypertensive effects of loop diuretics. If a loop diuretic is used for treatment of hypertension, it should be only in the later stages rather than the earlier stages. The earlier stages of hypertension, it is only the thiazide diuretics which can be used and the diuretics which act at the collecting system which is the potassium sparing diuretics and mineralocorticoid receptor antagonist. Essentially, when you treat hypertension in very early stages of chronic kidney disease it is the thiazide diuretics and the potassium sparing diuretic at the collecting duct. One should always understand why certain diuretics in clinical studies do better than the others, it is basically because of the pharmacologic, the pharmacokinetic, and pharmacodynamics effects of that particular diuretic. If you see hydrochlorothiazide, hydrochlorothiazide has a bioavailability which is acceptable 65 to 70, but the relative carbonic anhydrase inhibition, that means once you are giving a diuretic the response is there is significant increase in the tubular reabsorption of salt and water proximally at the proximal convoluted tubule. If the diuretic has to be good it has to prevent this proximal tubular re-absorption and that does not happen with hydrochlorothiazide. So whenever hydrochlorothiazide was used as a diuretic in studies it has failed to show benefit. It is the chlorthalidone which is a difference. Chlorthalidone has almost a similar bioavailability, 65% renally excreted. The effect on the proximal convoluted tubule it is three times or four times more than the hydrochlorothiazide. Whenever a chlorthalidone was used as a diuretic in hypertensive studies it did much better than hydrochlorothiazide. It is the basic pharmacokinetic difference where one diuretic does better than the other and that is why chlorthalidone is a much much better diuretic as compared to hydrochlorothiazide. The second biggest advantage of chlorthalidone is the duration of action. The elimination half life is 50 to 60 hours which for hydrochlorothiazide is just 9 to 10 hours. So there is a waning effect of hypertension when you use hydrochlorothiazide. Therefore, when they studied hydrochlorothiazide singly as an antihypertensive drug it failed because this diuretic has a duration of action of only 9 to 10 hours. But when they studied chlorthalidone it did well because the elimination half life is almost 6 to 7 times. So even a single dose would keep the diuresis going on and therefore control hypertension well. It is the pharmacokinetic difference between these drugs and therefore there are studies where chlorthalidone was used and it did well and hydrochlorothiazide was used and it failed to show any benefit. The ALLHAT trial, the basic need for this trial was the National Institute of Health in the US, they found that the cost of antihypertensive was much more than 6 to 7 billion dollars, therefore they decided to do a study and this was a huge study. It was randomized, double-blind, multicenter trial conducted for a long period with the main followup acceptable around 5 years, 33,000 participants and there were four arms. One was a diuretic chlorthalidone, calcium channel blocker, ACE inhibitors, and doxazosin. Doxazosin was discontinued because it trended towards higher mortality. The primary end point of this study was fatal coronary heart disease and non-fatal MI. As with all studies in cardiovascular disease and secondary endpoints which was all cause mortality, fatal and non-fatal stroke, coronary artery vents, the combined cardiovascular disease the blood pressure goal in this study was the same, less than 140/90, as with all antihypertensive studies. The initial dose of these drugs were 12.5, 25 was the max for chlorthalidone, amlodipine was 10, lisinopril 10. The point to note is the use of the second drug. The second drug used was reserpine which we hardly use today, clonidine which we are not using except the nephrologist as the second drug to treat hypertension, and the atenolol as a speaker earlier showed that atenolol failed miserably in most of the studies and the third drug was hydralazine which is hardly available in our country. Though it was a very elegant study and it showed that there was a significant benefit with chlorthalidone the inclusion criteria for these patients was, patients who are 55 years, patients who are hypertensive, with one risk factor prior MI or stroke, LVH, type 2 diabetes, smoker, atherosclerosis. The exclusions were symptomatic or hospitalizations for heart failure, EF of 35%, prior medications stopped with the first dose. What was the study patients? The mean age of the study population was 67 years, blacks were 32%, women equal, baseline BP was 146/84 receiving antihypertensive treatment earlier were 90%, prior MI stroke 23%, type 2 diabetes significant number. All these three drugs showed almost equal control of the blood pressure as well as the cumulative event rate was almost similar, but the control of hypertension was much superior in patients with chlorthalidone. At the end of one year chlorthalidone had a significant reduction in the blood pressure as compared to amlodipine and lisinopril. The majority of these patients required more than two drugs, in 60% of the patients. Why did the chlorthalidone group did well, I will try to explain it. The conclusion was the ACE inhibitor, dihydropyridine, calcium channel blockers are no better than thiazide-type diuretics in reducing the cardiovascular risk. Antihypertensive therapy based on thiazide yields better BP control that was concluded. Thiazide-type diuretics are significantly less expensive, that we all know. Thiazide-type diuretics were effective in controlling economically first line antihypertensives. This was the ALLHAT. There were limitations to ALLHAT study and I will come to that later. The second study where the antihypertensives did well was the HYVET study which studied antihypertensives, the diuretic indapamide with perindopril or matching placebos to target BP of 150/80 and this study definitely was in an elderly population. The blood pressure control with the active treatment group was lower as compared to the placebo. The all-cause mortality cardiovascular risk, strokes were significantly less in the treatment group which included indapamide and with or without perindopril in elderly patients. In elderly patients, patients receiving diuretic did extremely well. Then there was a third study which was the ACCOMPLISH Trial where diuretic did not show any benefit and there was a reason to it because they used hydrochlorothiazide just to show that combination of hydrochlorothiazide plus benazepril was less superior to the amlodipine and this is what they proved. It was a study of more than 10,000 patients, 5000 in each arm. The blood pressure control was almost identical in both the groups, but there was a significant benefit with benazepril and amlodipine as compared to benazepril plus hydrochlorothiazide and this is because probably they used less potent drug. The conclusion of ACCOMPLISH Trial was that the patients who were on benazepril/hydrochlorothiazide failed to show any reduction in cardiovascular events as compared to the amlodipine group. We go beyond the antihypertensive effect and that is the renoprotective effect of these mineralocorticoids blockers in proteinuric renal disease. This was a very recent study which was published in the NDT where 87 patients who were having a proteinuria of more than 1 g, who in spite of ACE and ARB blockade, a good followup of around 25 months showed that there was a significant reduction in the proteinuria in patients who were already on ACE and ARBs where spironolactone was added. The initial period when spironolactone was added there was a drop in GFR and that was because of altered autoregulation. Once you are suppressing the renin system you have an afferent arteriolar vasodilation or vasoconstriction as compared to the efferent arteriolar vasodilation. You have more of an efferent arteriolar vasodilation and this is because of reduction in the intraglomerular pressures. Once you have reduction in intraglomerular pressure your proteinuria comes down, that happens with all ACE and ARBs. But when you add an angiotensin receptor blocker this further worsens, you can have a significant reduction in the GFR, but over a period of time because this intraglomerular pressures are low all the adaptations they continue therefore lot of hemodynamic factors they continue to remain in place. The proteinuria related effects they come down. There is a significantly less tubulointerstitial atrophy and fibrosis and because of this proteinuria reduction there is a significant improvement in the GFR over a period of time and the same thing happened with worsening of GFR and the reduction in the proteinuria which was seen when an ARB and ACE they were supplemented with mineralocorticoid blockers, mainly the spironolactone. The conclusion was spironolactone induces an initial fall. Those patients who have an initial fall in GFR, those patients where the GFR significantly comes down when you add an ACE and ARB these are the patients who are going to have the maximum benefit. The reduction in the GFR signifies that these patients are having a significant intraglomerular hypertension. Once you add the ACE and ARBs the GFR drops because the intraglomerular hypertension reduces and thereby proteinuria reduces and these are the patients who are going to have the maximum benefit. So the acceptable decrease in the GFR after adding ACE and ARBs which was initially 25% now it has been relaxed to 30%. How do we select the drug? This is a key which has been of this Laragh’s hypothesis. The initial individualization of treatment should be based on the plasma renin activity, that we are doing and if the patient has a plasma renin activity of less than 0.65 it is a volume mediated hypertension. If it is more than 0.65 ng/mL per hour it’s a renin mediatory. So those patients who have less than 0.65 should be given volume mediated drugs which is diuretics, calcium channel blockers, and they should be individualized based on the patients. If it is an elderly patient, yes it is a diuretic. If it is a slightly young patient, calcium channel blockers. If it is more than 0.65 than it is an ACE/ARB, you can use either of the drugs, but ACE and ARBs are preferred. How do we start the drug? Measure the BP, collect the sample for PRA. If the PRA remains high or it remains low add a volume drug. If you see a PRA which is low and if you find a hypokalemia you should always think that there could be an underlying primary hyperaldosteronism. To confirm primary hyperaldosteronism do a plasma renin activity and a serum aldosterone ratio, if the plasma aldosterone ratio is very low that means it confirms that this patient is having a primary hyperaldosteronism. In patients who have a high PRA start them with a renin drug, ACE or ARBs. If you find that the PRA is more than 1.6 then it should alarm you that this patient could be having an underlying renovascular hypertension and start investigating for renovascular. If your blood pressure remains controlled with volume drug continue the drug or the renin drug continue the drug. If it remains uncontrolled then you increase the dose, double the dose. If the BP is controlled, continue it. If BP remains uncontrolled, add renin drug to volume drug. If it is an ACE/ARB add a calcium channel blocker or if it is a calcium channel blocker add a renin drug. Increase the doses of renin drug, continue the drugs and if the BP still remains high do a PRA and if the PRA is accordingly then add the third drug which is acting on the renin or the volume. We come back to case 1, for this patient we stopped all antihypertensives for 7 days. We did the PRA, PRA was low. All drugs that the patient was on; telmisartan, ramipril, everything was stopped. The patient was started on chlorthalidone 12.5 mg. After one week the pressures were under control. Four drug stopped, the patient remained 130/80, and that is how hypertension treatment should be individualized. The next case, its an end-stage kidney disease requiring 8 different drugs, this is all volume. This patient underwent a transplant recently, just a few weeks back. On day three her creatinine was 0.33. Her kidneys were able to manage the volume well, she lost 7 kg, it was all water. She came off all antihypertensives. So it is the kidney and it is volume. It is very important to consider volume and use a diuretic even at very very early stages, but the use of diuretic should be individualized it should not be arbitrary.